Designing dresses for public figures such as the late Princess Diana and Freddie Mercury, as well as working on collaborations with labels that include Valentino and MAC make-up, are just a few of Zandra Rhode’s achievements, since she began her own fashion house back in 1969. 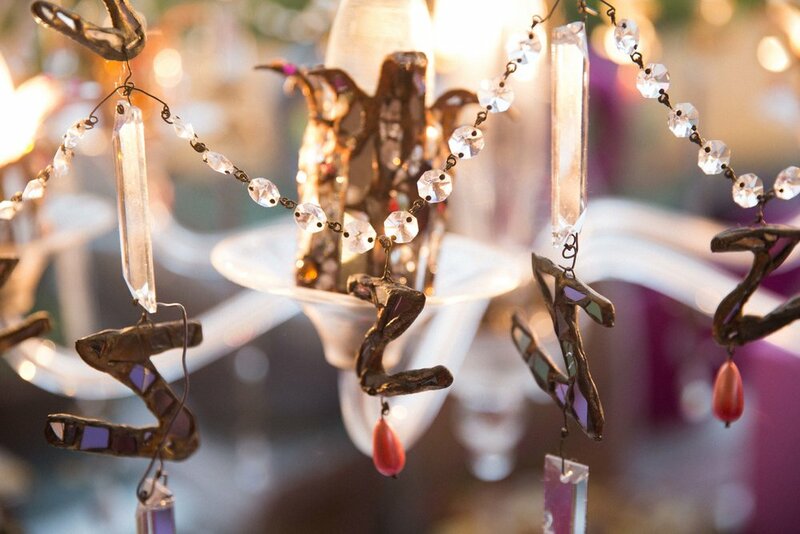 Zandra’s designs mirror and compliment her personality. 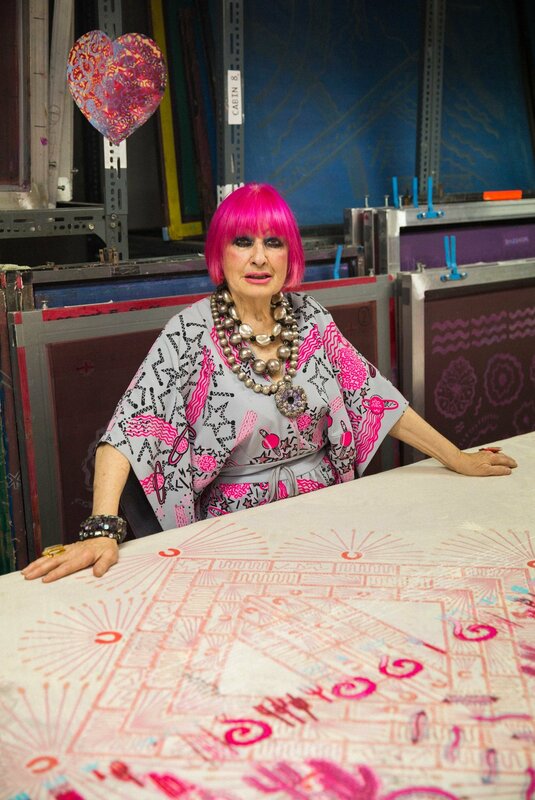 Her creations, as well as her bright pink hair and theatrical makeup, have become respected and integral to the development of the international fashion and textile industries, as she was one of the new wave British designers from the 1970s to put London at the forefront of the international fashion scene. Her bold prints and fiercely feminine patterns are what make them utterly timeless and an unmistakably Rhodes creation. On top of creating her global brand, Rhode’s set up The Fashion & Textile museum in 2003, as she dedicates the space to showing designers from the 1950s onwards. The fittingly pink and orange building was designed by the Mexican architect Ricardo Legorreta and is currently exhibiting the works of Louise Dahl-Wolfe; one of the most important female fashion photographers of the first part of the 20th century. Ahead of the Marguerite dinner in Zandra's joyful rainbow penthouse, she kindly invited Marguerite to speak with her about what advice she would give to young women starting out in their careers and why sometimes it takes time to work out what your creative skill may be. You learnt to hand print and have said that the process ultimately produces a ‘living art work’ - can you explain this to me in further detail? When you are born a creative, sometimes it takes a while to work out what your medium will be. My mother worked for Worth in Paris, back then it was standard that ‘Designers’ and artists were nearly always men, dressmakers and workers were women. My mother told me I could be and do anything and I believed her. I guess it was a given that I would apply my ‘art’ to clothes because it was in my blood, she was an amazing couTURIER and teacher. When people talk about fashion as art, I can only agree to an extent. Mass production is not an art it’s industry. I’ve kept my techniques the same, silk screen printing is over a hundred years old, to keep my dresses as related to their production as possible. I approach the design process a different way from most, as I start by designing the print, I then put the print onto the body and the garments then forms itself around the body. That’s when the body becomes art, a choice to be more than just a human in a daily uniform. You own one of the few printing tables left in london - does it sadden you to think that this technique and process of printmaking could eventually die out as we live in a world which continually seems to move towards mass production? I hope that screen printing will not die out!!! What I’m afraid of is that the skill of making a print in repeat that looks good, natural and symbiotic is dying out and now we just get simplistic designs that are just mirrored on the computer. The Less the eye is challenged the less it expects. You say that there is no right or wrong to technique, provided that as a designer, you do the best you can, and that every woman who puts on their dress feels great. Do you ever get nervous about your designs and whether they will be ‘liked’ by your clientele? As a designer you have to decide if your work Is what you can stand or fall by. I have stuck to my guns and that I can take to my grave with me, i was always authentic to myself and my art. However though I have always felt like I am a tightrope Walker that can fall any time, because the fashion terrain doesn’t just change to destabilise the consumer. I am always happily laid bare in my print design, it comes from my eyes, to my mind, to my hand, there’s a higher channelling process for anyone who comes up with an original idea. Sometimes the flow comes so easily sometimes not so. We are thankfully now in a time that is focussing again on process, for a long time Fashion has been focussed on establishing itself as a big industry contender like some kind of teenager. It must be hugely satisfying to see the development of your designs from the initial idea/sketches to the final product - do you have a particular moment in your career that you feel most proud of? No matter what I do now, the fact that my early works are in the V&A and the MET is all anyone could want from a career. You can have all the money you want, but there’s no pockets in a shroud. I’d like to be remembered for doing things differently, and that some amazingly talented other people wanted in on that idea too, Freddie Mercury, Princess Diana, Jackie O, all defined my best moments, I look forward a fabulous dinner party on the other side! How did Valentino approach you to collaborate with the brand on their Spring/Summer 17 Collection? Simply by the wonder of technology! They got in touch with my office and Pierpaolo came over to my studio. I had already started working on my Archive Collection that launched last September, and they loved the pieces we were looking at too and so became a natural progression to work from them to feel cohesive. I read that the prints for the collaboration with Valentino took inspiration from Hieronymous Bosch's 'The Garden of Earthly Delights' as well as pieces taken from your own archive. Is Bosch an artist whose work you admire? The idea of channelling the Bosch painting was Pierpaolo’s, an beautiful choice, and when you have all the power of Valentino behind you it must feel like you are designing clothes to be worn in The Garden of Earthly Delights! You literally have access to any technique any fabric any process, literally a dream! I have lots of work by Duggie Fields, Allen Jones and Andrew Logan who are my art tribe. I also avidly collect ceramic art by Kate Malone and Carole McNicholl, but the one work id still like to add is by David Hockney. When I went to the RCA he was already there, he depicts California, where I live, as only a Yorkshire man can do. Do you have a favourite exhibition that you have seen in the last year? I’ve loved seeing Princess Diana’s style moments beautifully curated at Kensington Palace. She was of course one of my most favourite clients, shy but knew what she wanted. She used her imagination and creativity in her wardrobe and clearly felt passionately about her choices which I so admire. The cherry blossom pink dress she commissioned from me will always be one of career highlights. Work harder than you think you can, find your tribe, be kind, say yes, help others wherever possible. 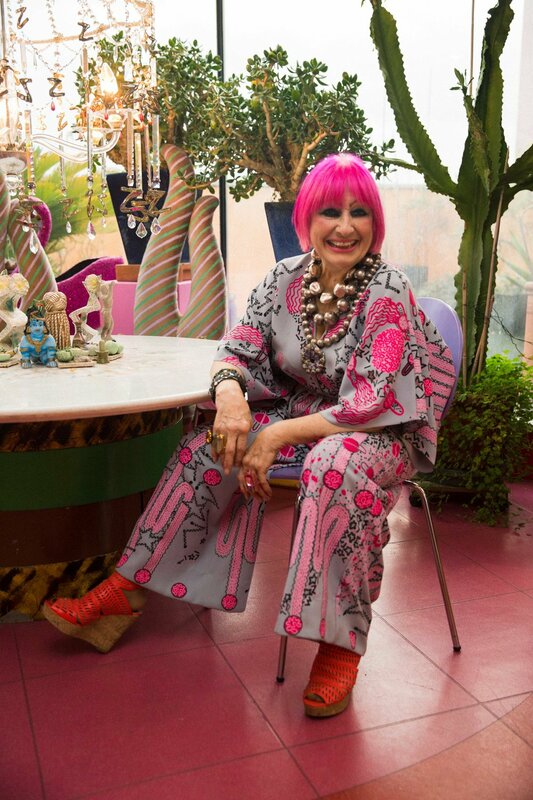 The Marguerite dinner hosted by Zandra in her joyful rainbow penthouse will take place on Wednesday 5 December. The event is now fully booked but keep an eye on our Instagram for a sneak peek of all of the fun and games!